For the first time in the history of the iconic Ford Explorer, the SUV will become a global vehicle and will be produced outside the U.S. Where has Ford started production? If you don’t think we live in a new global era, just look at what’s happening at the Ford Motor Company. Next year, the new 2015 Ford Mustang will become a global car and it get's a new design that will attract new buyers around the world. The Ford Mustang will become a global car for the first time in the companies history as the Mustang celebrates its 50th birthday. What does Ford have planned for the new Explorer? The new 2013 Ford Explorer will also become a global vehicle as the Dearborn company has announced that the Explorer will be built for the first time outside the U.S. Ford in a joint venture with Ford Soilers in Russia, launched the start of full production of the Ford Explorer. The new Russian-built SUVs are being assembled in Ford Sollers Elabuga Assembly Plant in the Republic of Tatarstan for the Russian market. Why did Ford choose Russia for its new overseas production plant? And Ford isn’t stopping with the Russian market production launch of the new Explorer. Ford is also planning to enter the Chinese market which is the largest auto market in the world. Explorer sales are scheduled to begin in China in the next few weeks. The new Explorer is already a global SUV with exports last year increasing nearly 65 percent from 2011, to more than 24,000 units. Ford has been advancing the Explorer around the globe for quite some time and it's already a global SUV. Ford reports that the Explorer was shipped to 64 countries including Canada, Mexico and Saudi Arabia. The Explorer was previously sold in Russia and last year Ford Sollers sold more than 400 Explorers, a record in Russia. Before the new plant was built, Ford would ship partially assembled vehicles that were from the home plant in Chicago. They would also send along all the parts needed to complete them. The Explorers were then fully assembled at the local Russian facility. In Russia, SUV sales accounted for 31 percent of the market in 2012, according to data from Russia’s AUTOSTAT market-research agency. Ford recognized the potential for the Explorer in Russia and took an educated risk of building the new Ford Sollers Elabuga Assembly Plant in the Republic of Tatarstan for the Russian market. Ford will hire an additional 500 employess in Russia as sales begin to ramp up. The Chicago Assembly Plant will continue to produce new 2013 Ford Explorers for the U.S. and more than 60 other countries around the world. The Explorer is truly a global vehicle. 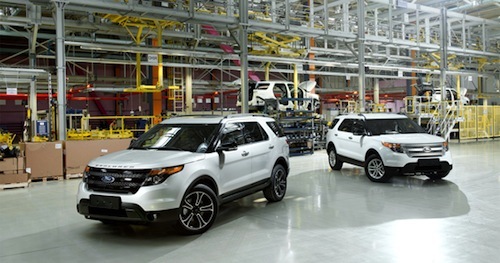 Watch the Ford Explorer production begins in Russia video.